As most of my readers know, I'm a long-time evaluator of GPS devices and Trip Planning applications. In the past ten years I've also been watching and evaluating mobile navigation Apps. I've had a few favorites from time to time but only a few have really been focused on motorcycle riders from either a feature/function or user interface perspective. 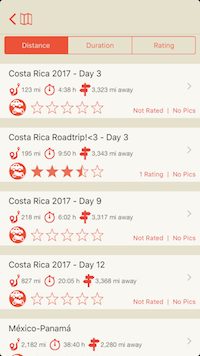 Scenic has been available now for just over a year and is a free-to-download App developed by Applified Life whose owner/developer, Guido van Eijsden, is also an avid rider. His website, Motomappers.com, is the place to find the latest info on the product and Guido's Blog. Scenic is currently only available on Apple iPhone and iPad via the Apple App Store. It is one of the few that properly support both iPhone and iPad in portrait and landscape orientations. For you Android users, Guido is open to the possibility but don't expect it in 2018 as he is working full-time on a major update to the Apple version of Scenic. This is no simple code update but rather a complete rewrite of the Scenic code to optimize performance, usability and improve stability. 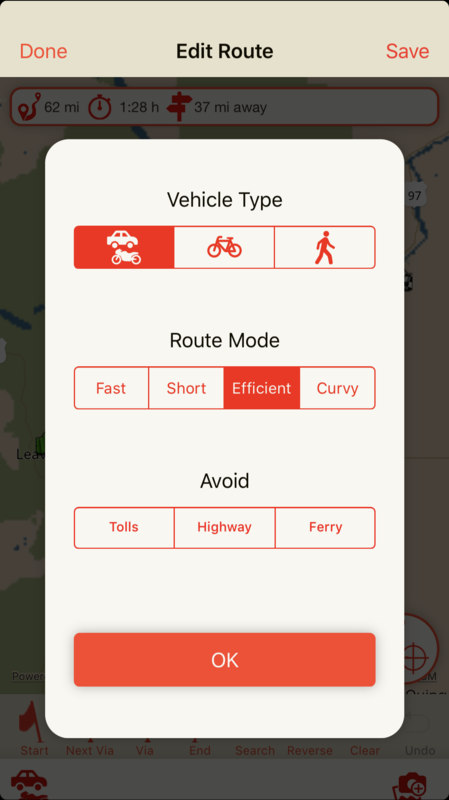 But, that's not all, Guido is adding features that have been requested over the past year from many of the Scenic users: for example, Custom POI support and route/trip management (sorting and grouping into folders/categories). Pricing is the first or maybe second thing most of us look at when it comes to mobile Apps. For me, it's the second thing right after all of the features I require. Scenic uses OSM maps sourced from a service. Aside from feeding and clothing Guido's family and keeping his servers running, it's this Map service, the routing engine and Voice Guidance Licenses that drives the cost and hence the In-App Purchases. 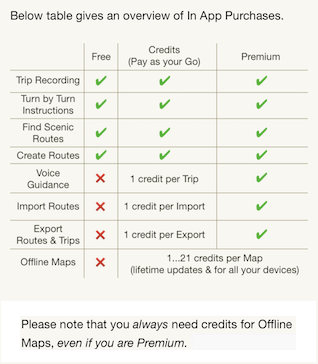 Each new user receives a number of Credits so they can check out the Premium features with maps. If you decide Scenic works for you and you are an avid long distance traveler, I strongly recommend the Premium Forever one-time fee. Otherwise, just choose Premium or Pay-as-you-go. Credit package costs can be seen at the Scenic page in the Apple App Store. The App is very easy to use and it really only takes a few times using each of the major features to become familiar with how each works. Having said that I'll lay out below the current versions main features. 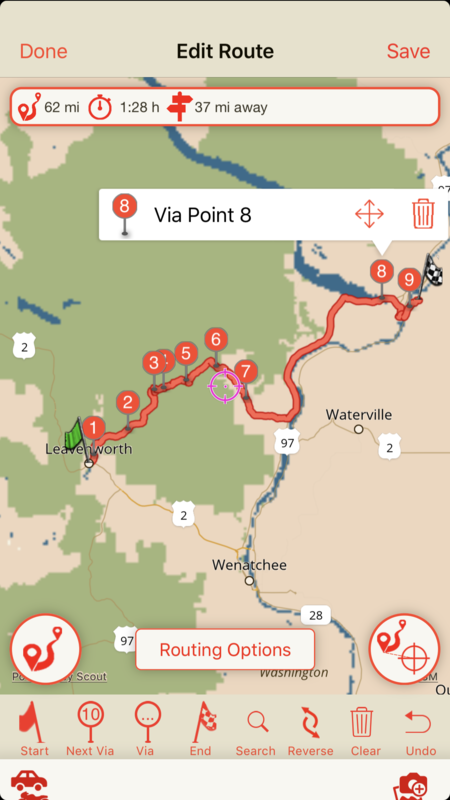 Routes: If you are creating them within Scenic, you can use up to 200 points to shape your route path - that's a lot of points. You can also just select a destination and Scenic will route you there. Want to use an imported Track, no problem, Scenic will navigate that for you as well. There is another nice feature to routing within Scenic when you start a saved route. Below the Start Trip button are the routing options where you can set Scenic to guide you to the start of the route if you are not at the beginning. And, Navigation Voice prompts are available in 21 languages - which of course you can turn off at any time if you so desire. Routing Settings: The routing engine uses a Curvy road weighted algorithm to calculate your route path. 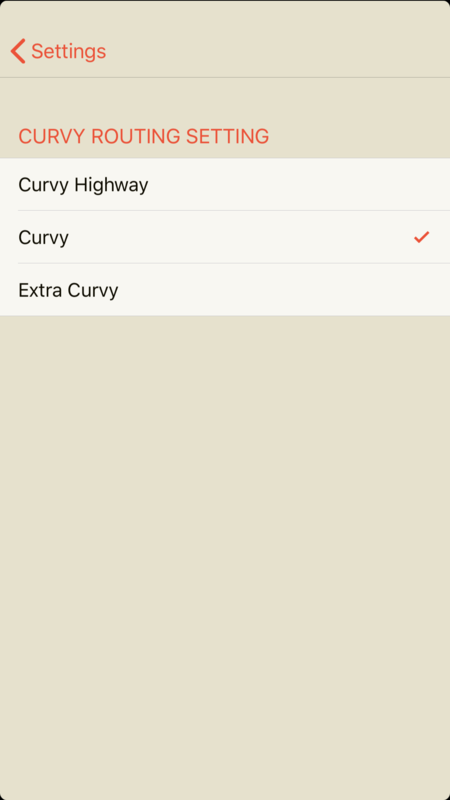 You can select from: Curvy Highway, Curvy and Extra Curvy. When you Edit a save route you have the option of changing how it will be recalculated between your route points. Maps: The OSM maps are downloaded to your device so make sure you have sufficient storage space to do so. 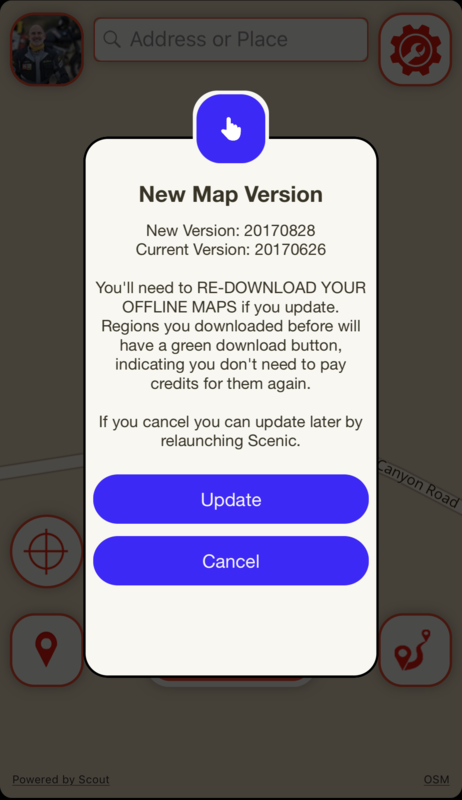 When you open the Scenic App while online, it will check for Map version updates. If there is an update read the notice carefully because if you have a lot of maps installed and you Update, you will need to download all of your maps again. This is an area where Scenic could do better by automatically downloading your paid for maps. It would also be nice to have a single US Map download pick rather than having to download each state individually. 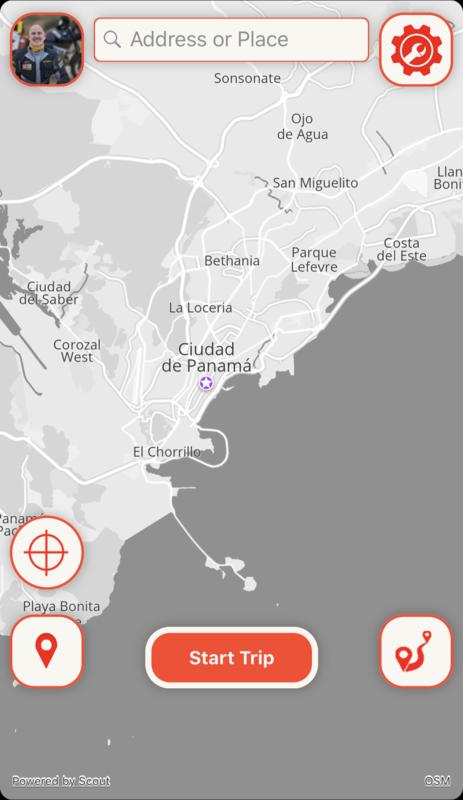 You can configure the Map Style in Settings: Standard, Gray and Outdoor. I find the Outdoor to be the most visible outdoors or indoors. Gray is not very useful in my opinion as there is very little contrast between map background and roads. Have lots of maps, read carefully. Standard, a bit to pail for me. Outdoor, is just right for me. 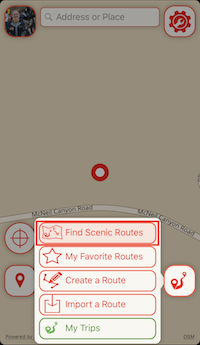 Routes: You can plan your routes within Scenic. 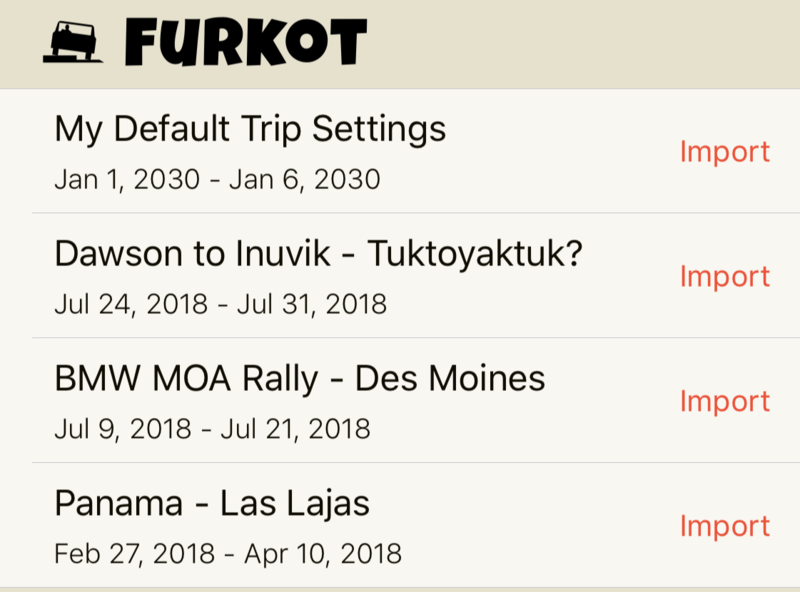 I prefer to use a more robust Trip Planner for my long trips so I use Furkot.com. 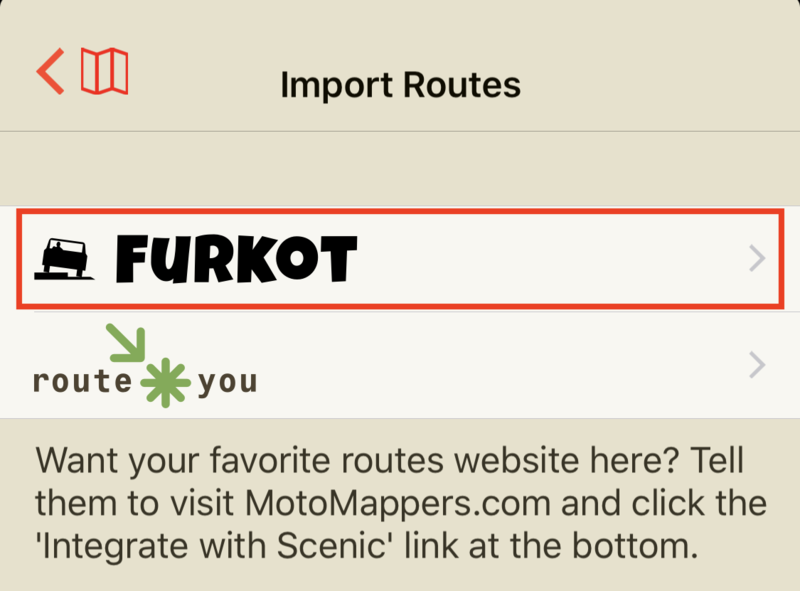 My Scenic and Furkot accounts can be easily linked such that all of my Furkot Trip Plans can be seen in Scenics Route Import screen when I select the Furkot option. No separate download and import required on my part. 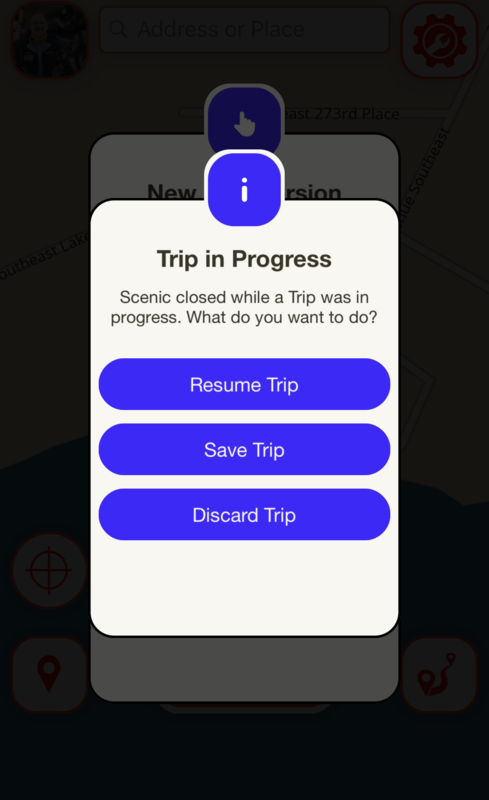 If you use an online Trip Planner and want it to link to Scenic, ask the app developer to visit Motomappers.com and click on the "Partnerships & Integration" link at the bottom of the page. There are several ways to link data in other Apps to Scenic but the most seamless way is via custom integration like Furkot and RouteYou. The App developer will need to contact Motomappers.com for this level of integration. Sources of Route Planning data: You can import files from your favorite planning app if they use the following file formats: GPX, KML, GDB, Kurviger and ITN. Or, you can point Scenic to one of those file type out on the Internet using the files Internet address. 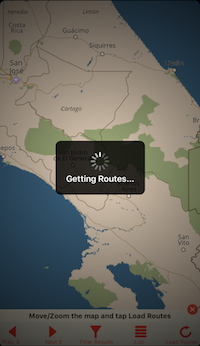 If you just have to use Google Maps to create a route you can use the Scenic WebApp to import your route. It's not quite as simple as the other methods of importing a route but it does work well. Check out the Scenic video on the Google Maps topic. Route Creation/Editing: This has become a real strong point for Scenic. It's very easy to create a new route or edit existing route points in a saved Route. 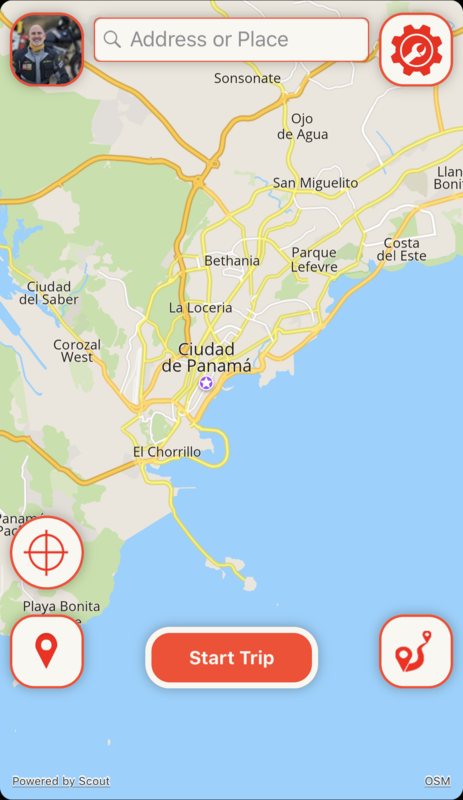 In Edit mode, you can reverse your route, add and delete points and Search Google for places online and in the OSM maps. The current Scenic version does not use drag-n-drop to move a route point - maybe we'll see this in the coming update. 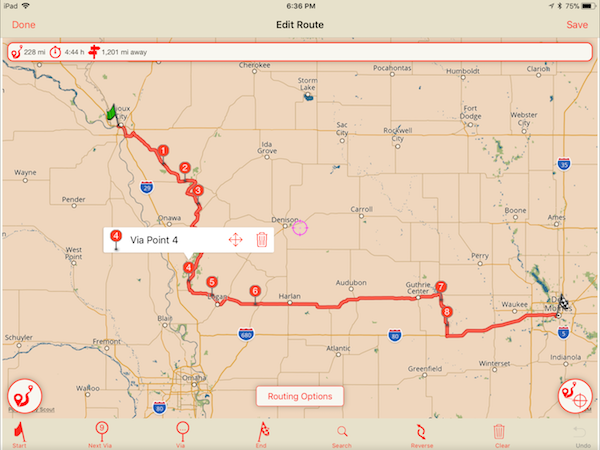 Route editing is simple and seems to work very well - drag-n-drop would put Scenic over the top. 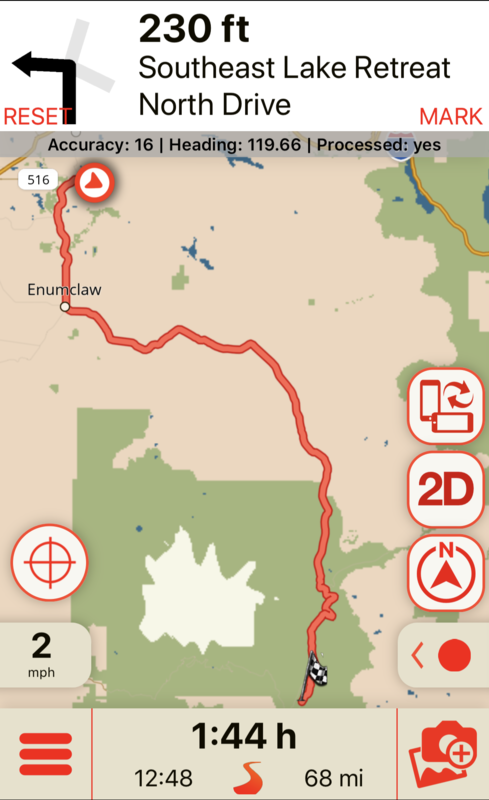 Trip Recording: Whether it's a new trip or a saved one, it's simple, just press the Start Trip button on the Map screen. 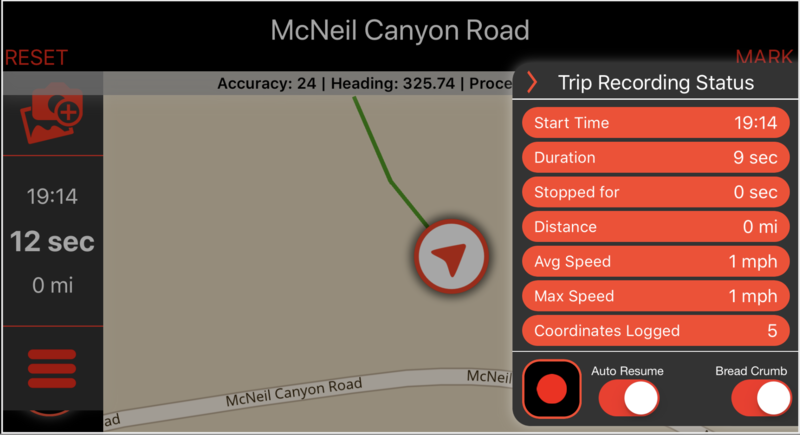 Scenics tracking feature allows you to save your riding adventures. With every ride you take, whether you're navigating a route or not, your ride is tracked. Scenic records your speed, the roads you took and the pictures taken along the way. 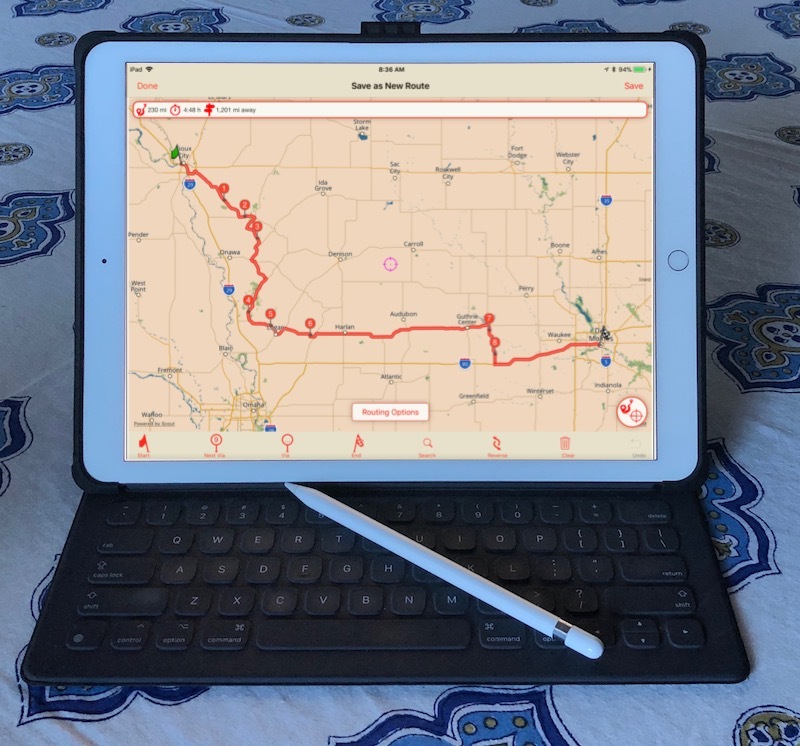 Every trip you ever took can be shared on social media, exported to GPX files and even turned into a navigable route so you can ride it again. Ride Sharing: Scenics server side has a "private" repository for Scenic users to share their rides with each other. I don't do much sharing but for those that do, it's a well integrated feature. Rate, Save and Edit if you wish. 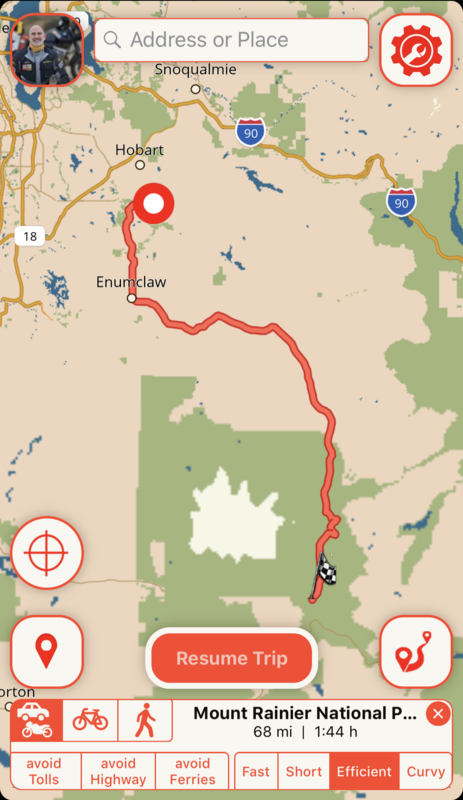 If you've read any of my previous GPS articles, or attended one of my seminars, you know I use the following "Basic Criteria for an Adventure Riding GPS" to determine if any GPS Navigation device is something I would recommend to our clients - or anyone else. Scenic has enough going for it to warrant a check. No, Apple doesn't make a blue iPad Pro - just early morning and low light. Glove Friendly: Scenic has reasonably large on-screen icons for interacting with the App while you are stopped. I would strongly recommend not trying to do so while riding. Mainstream mobile devices haven't quite checked off all of the boxes yet but, in my opinion, from a software perspective the Scenic App has checked off all of the criteria that pertain to it and it is my "go-to" mobile navigation App when I'm on the bike. And, if Guido has the time to make Scenic Apple CarPlay compatible, it will be my "In-Car" navigation App as well for those planned road trips in the Corvette.